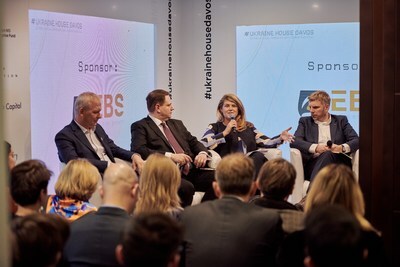 Ukraine's tech sector is growing so fast that it is likely to achieve seven unicorns, or start-ups companies that achieve a billion-dollar valuation, in the next few years, according to panellists at Ukraine House Davos. Ukraine's tech sector has grown at an average of 28 per cent annually over the last three years and the capital Kyiv is now challenging more established centers to become one of the top tech hubs of Europe. "Last year we already had two companies that became unicorn companies and I predict that in the next few years we will have a total of seven," said Andrey Kolodyuk, Chairman of Ukrainian Venture Capital & Private Equity Association and also Managing Partner of Aventures Capital. Code collaboration and development operations platform GitLab raised $100 million in September last year giving the company a valuation of $1.1 billion, while bitcoin mining infrastructure provider Bitfury raised $80 million in a closed funding round in December, becoming the second Ukrainian unicorn. Mr Kolodyuk said he expected Ukraine's next unicorns to include Grammerly, the spelling app; Softserve, the developer; Ciklum, the software development outsourcing company; and Rosetka, the e-commerce company. The prediction was made on a panel "Emerging Markets: Faster Growth or Fasten your Seatbelts" sponsored by EBS and moderated by Helen Volska, its founding partner. Ukraine is becoming increasingly popular for private equity and venture capital investors, as witnessed by the UVCA which added 12 new members in the last year. Lenna Koszarny, Founding Partner and CEO at Horizon Capital, said the IT services sector had grown from $110 million industry in 2003 to a $3.6 billion last year. "This is all very new for Ukraine, but it has delivered a J-curve in terms of growth," she said. The improved investment outlook for Ukraine was partly attributed to progress in improving the investment climate, which has been recognised by benchmark rankings. Ukraine has risen 81 spots on the World Bank's ease of doing business ranking to 71st place, above Brazil, Argentina and India, Ms Koszarny said. On the Global Innovation Index, Ukraine is placed at 43, above India and many other emerging markets. "Ukraine has a competitive advantage in terms of the rise of exports to the EU, we have seen food and agriculture continue to deliver double digit growth and 28 per cent growth for IT services," she said. Ukraine is receiving interest from contrarian investors, she added, including financial investors, hedge funds, regional private equity, family offices, foundations, pension funds and investors looking for value. "In many markets you are talking about 15-20 times EBITDA pricing, while Ukraine offers value with fabulous companies, strong entrepreneurs, strong systems, lots of depth and substance priced in a value way," she added. Andy Hunder, President of the American Chamber of Commerce in Ukraine, said 74 per cent of his members were expecting another year of growth in 2019 despite continuing conflict with Russia and a series of presidential and parliamentary elections starting in March. On Wednesday, Ukraine House Davos is expected to host the National Investment Council meeting in the presence of President Petro Poroshenko and a high-level government delegation.